"The Choir, which is constructive, consists of four bays, with a semi-hexagonal apse and aisles. 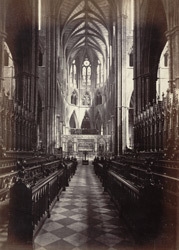 It differs in some of its details from the Nave, than which it is earlier, having been built 1245-69, while the earliest portion of the Nave (that nearest the Choir) was erected 1269-72. The admeasurements of the Choir are as follows: - length, 155 feet 9 inches; breadth, 38 feet 4 inches; height, 101 feet 2 inches. The light and graceful piers are ornamented with detached shafts, filletted with brass. The double row of stalls, in the style of Edward III., was designed by Blore, and carved by Ruddle of Peterborough, and was set up in 1848. The Organ is by Hill, and arranged on either side of the screen." Westminster Abbey was founded by Edward the Confessor and was consecrated in AD1065. It was rebuilt in the 13th century in the French gothic style, with a nave of great height, flying buttresses and rose windows. The monastery was dissolved by Henry VIII in 1540 and the abbey became the cathedral of the new diocese of Westminster. Most British monarchs are buried at Westminster Abbey and it has been the crowning place for all sovereigns since the 11th century.